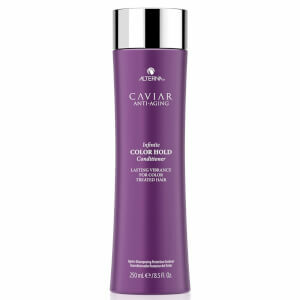 Maximise tone and vibrancy with the Alterna Caviar Infinite Color Shampoo. Fortified with a Dual Capture Complex, the sulfate-free formula delivers powerful protection from dulling UV rays and helps prevent color fade for long-lasting results. Infused with age defying Caviar extract, it sweeps away dirt and impurities without stripping essential moisture and oils, leaving locks looking refreshed and revitalised with maximum shine and color.